I am research fellow at La Trobe Law School and the author of Women and Sharia Law in Northern Indonesia: Local Women's NGOS and the reform of Islamic law in Aceh, published by Routledge 2015. I was previously the Head of International Relations Department at the State Islamic University (UIN) Syarif Hidayatullah Jakarta and Deputy Director of Center for the Study of Islam and Society (PPIM) also at UIN Jakarta and editor to Jurnal Studia Islamika. I have extensive experience working as consultant for international development program working in the area of legal reform and women's rights in Indonesia. 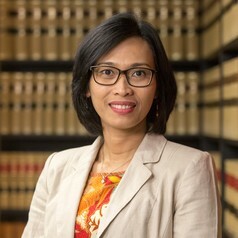 I am an associate at the Centre for Indonesian Law, Islam and Society (CILIS) at Melbourne Law School and a fellow to the Center of Social Difference at Columbia University. I am the founder of Australia-Indonesia Disability Research and Advocacy Network (AIDRAN).